I needed to brew something quick. There are two carboys ready to rack, and yeast ready to ferment again. I've got a friend's beer scheduled for Tuesday, but thought I'd get one in before then. Was looking around for inspiration, when low and behold, there's some right around the corner. Kevin just brewed a batch that looks quite tasty for the upcoming warmer months. A pale ale with lots of rye and what looks like some smooth and easy hopping. I've been wanting to play around with a pale rye ale for some time now, so it seems perfect. Kevin used rye malt. I wanted to use the malted product as well, but none was to be found at our LHBS. This created a pretty big brain freeze, and initiated some spontaneous creative thought. I'll going with 30% flaked rye. Just a small addition of sweet/aromatic malts should help with balance. A few more things should make this beer different than other pale ales. Half a pound of Turbinado cane sugar may add dryness. Orange peel and Grains of Paradise will add complexity to the citrus hop notes, and a secret spiciness. These special additions should play well with fairly bold hopping of Cluster and Mt. Hood. After its finished, some dry hops will provide a kiss of delightful hop aroma. As I wrap up with this post, I noticed under two hours after being exposed to a massive yeast cake, a mountain of foam is already steadily gushing out form a vigorous ferment. Absolutely fantastic! I also noticed two differences about this rye wort. 1. It had a milky cloudiness to it, and didn't seem to produce hot break or cold break protein coagulation. 2. It had a thick sort-of syrupy texture. I hope it clears up after fermentation, and perhaps it may have a decent mouthfeel. That might be nice considering the color is super pale. Drinkability: Very drinkable pale rye beer and great balance overall. Could enjoy a number of them easily. Quite refreshing. The sugar did seem to dry the taste, and reminds me of how imported English bitter pale ales taste, especially The Black Sheep Ale. matt, I knew you'd get a kick out of this one. It should ferment very quickly and be dry-hopped for about 1-2 weeks. Come on out for the big bash on the 14th, and there should be 3 different beers to try...two pale and one amber. Already the blow-off foam tastes sharp and bitter. I think paradise is already in sight. I believe they were out of rye malt, as it all ended up in mine. That said, it's always nice to inspire something other than disgust. I wonder if using the flakes versus the malt had something to do with the hot and cold break. It will be interesting to try these two beers side by side. They should be ready around the same time. I didn't pitch mine on to a yeast cake, but it still finished the primary in 3 days. Perhaps that was the rye as well. kevin, I called in, and they said they had 4 pounds of rye malt. When I got in there a couple hours later, it was all gone. Next time I'll have them set it aside for me. Luckily they had it flaked. After looking at the spent grains, I noticed the rye was gelatinous and kind-of slimy like the first running wort. Perhaps it didn't get broken down enough. The protein rest was very thick (about .75qt/lb). But then, maybe everything is just fine...I haven't used it like this before. Can't wait to compare. I hopped and flavored mine pretty good, so I hope we can still pick out similar rye flavors. A tangent for sure, but was wondering if you have a Chicago water report? I've been having some off flavors with any brew lighter than dark brown. Might be my mash technique, but figured I'd find out for sure before I reassessed. Salud. Ian, I don't think I have a Chicago water report, but I did see a very detailed report once. I think they changed what is available on the city website. Chicago is a major city with water profiles in many brewing books and sites. I have noticed that the water reports through egov.cityofchicago.org were fairly close and consistent year to year and to the books. They do treat the water pretty extensively, but the end result is quite clean and neutral tasting. The water can taste dramatically different just from the network of pipes leading to your any particluar faucet, and that can present problems. I filter all my water. But, off flavors can be intruduced at just about every stage in the process. 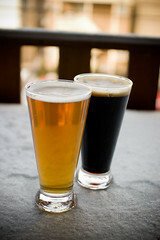 A dark or very hoppy beer has more intense flavors added that definitely mask off flavors from water or mashing problems. It's really difficult to say where its coming from. Chicago water is fairly soft, and I've noticed better tasing beers when the appropriate level of calcium (and sulfates & chlorides) and other salts are used to condition the water. This definitely helps the acidity of the mash with lighter colored beers, and acidity may play a role with how the enzymes convert starches into fermentable sugars. Have you played around with calcium and acid additions? And perhaps recorded any differences in pH? I'd like to talk more. Shoot me an email... redted8 at yahoo . com or better yet call 77 36 55 34 63. I came across your blog while doing some research on homebrewing. I'll be starting from scratch soon with extract beer (pretty common for first-timers I guess). I really enjoy your stuff. Very informative. If you've got any suggestions for good reading material on the subject, let me know. jeremy, thanks for stopping by. I brew all-grain, so if there are any questions about how these beers may convert to an extract recipe, I can attempt that. Read Charlie's The Comple Joy of Homebrewing to get a handle on things. Also John Palmer's book "How to Brew" is free online and he has great concise info there. As you understand more about how extract/steep recipes work and look like, then you could probably use Ray Daniel's "Designing Great Beers" as a reference for creating your own recipes. Simply look up recipes online as well, and you will find many to choose from. Keep in touch. I'd like to hear how you progress. How did your fermentation temps go in that back room over the hot days? Did you do anything to keep your beers cool? Mine kind of jumped on the beer I brewed Sunday up to 82 degrees. By the time I got around to doing anything about it, the krauesen had all dropped down, and it was already into the conditioning phase. The yeast had just finished my Rye beer and was at about 75 already, so my hope is that the extra temp won't cause too many of the heavier alcohol tastes. kevin, I was lucky that it fermented mostly during a couple cooler days and nights. After that I don't mind if the temp goes up even a good amount. I treat ales like lagers, and the first few days of fermentation is the most important with temp control. So I do take a look at the weather when I plan a brewday. Also, I do open the windows and put on a fan during the evenings til late morning. Then I close the windows and wait till evening to open them again. This helps a good amount on these Spring days, especially when its only warm for a few hours. The temperature in the carboy doesn't change nearly as fast as the temp outside. Also, if you are pitching on a huge yeast cake, higher temps shouldn't effect the flavor of your beer as much as a very low yeast count. It will start to ferment right after you pitch the (60-65*F) wort on top.